Derbyshire continued their positive response to last week’s backroom upheaval when successfully chasing 296 to beat Worcestershire by seven wickets in their opening Royal London Cup fixture at New Road. Hamish Rutherford led the way with a brilliant 104 from 76 balls, putting on 132 in 22 overs with Billy Godleman as Derbyshire registered their second win since Graeme Welch, the elite performance director, resigned on Friday. Having beaten Leicestershire in the NatWest T20 Blast within hours of Welch’s departure, they turned in another strong performance on a good batting surface. When Chesney Hughes was brilliantly run out by Ross Whiteley from deep point in the 10th over, Rutherford took charge with clean hitting in front of the wicket for seven sixes and six fours. Godleman may not have been quite as fluent but still reached 50 in 66 balls. Although they were bowled in quick succession, the wickets going to Daryl Mitchell and Ed Barnard, there were no signs of a wobble. Wayne Madsen and Neil Broom, the New Zealander unbeaten with 45, cleared off 104 runs in 12.1 overs to see their side home with 11 balls to spare. Madsen was as cool as ever, reaching 50 from 41 balls. In all he hit seven fours and a six while his partner picked off five boundaries as he also scored at better than a run-a-ball. Worcestershire won only one game in this competition last season, and although they began a new campaign with a challenging total of 295, their innings lacked a coherent pattern. When Mitchell won the toss, he took the chance on batting under early cloud cover and there were some problems as Andy Carter and Ben Cotton dismissed the openers with only 17 runs scored by the eighth over. Tom Kohler-Cadmore edged Cotton to second slip without scoring and Mitchell himself was bowled, middle stump, as Cotton took two for 24 in his new-ball spell. Alexei Kervezee led the initial counter-attack with a 33-ball half-century, which included three sixes, in his first List A appearance for the county in two years. 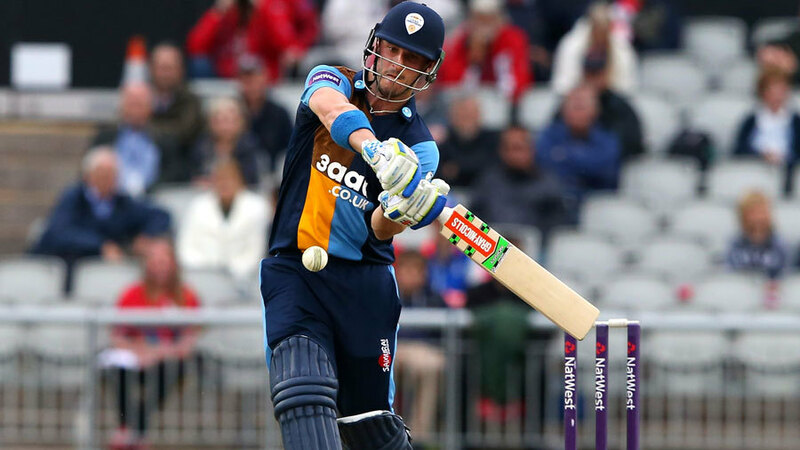 Following on from his match-winning 52 not out on the same pitch in Thursday’s NatWest T20 Blast clash with Yorkshire, he dominated a partnership of 115 in 14 overs with Joe Clarke. Kervezee was eventually out for 77, lbw to Shiv Thakor, and Clarke was run out for 44 when new batsman Brett D’Oliveira played the ball straight to Madsen at midwicket. With D’Oliveira soon bowled by Thakor, Worcestershire had lost half their side for 143 and it was left to Whiteley to lead a second phase. The former Derbyshire left hander made 61 from 49 balls, hitting six fours and two sixes before he as lbw to Matt Critchley, a consolation for the legspinner as he conceded 101 runs in his 10 overs. Ben Cox and Joe Leach chipped in with useful runs, but Cotton came back to take two more wickets for an impressive return of four for 43 and Carter struck in successive overs to close the innings with two balls left.